Today I made a new bird-themed paper pack I wanted to share with you. I used my free bird silhouettes and free vintage images from Graphic Fairy to create the patterns. I hope you enjoy using these in your own designs! And like all of the design elements I create and post on this blog, you can use these personally or commercially. Just please don't resale them "as is". 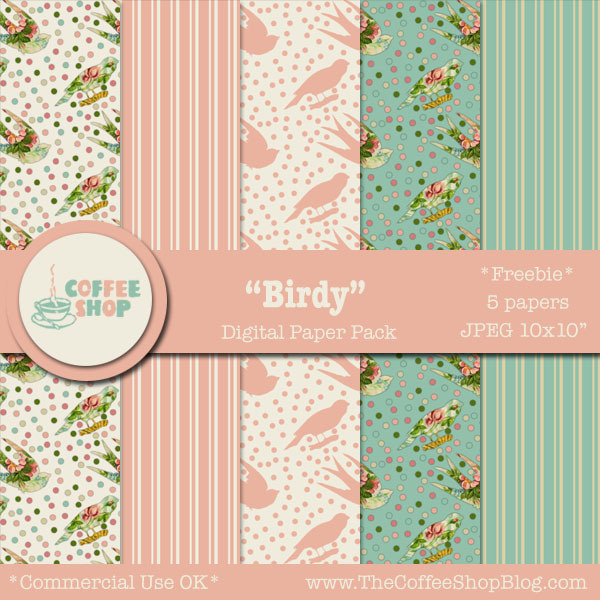 Download the CoffeeShop "Birdy" digital paper set. So pretty! Thank you very much! These turned out lovely Rita. Thank you so much. Oh gosh! These are beautiful! muchas gracias, muy bello trabajo. You are so welcome, thank you!! !